Gun Free Zones Kill – Now 9 in Charleston, S.C.
Once again liberal law makers have put their own constituents in harm’s way and the unthinkable has happened – 9 innocent victims were needlessly massacred while studying the Bible at their church. When are they going to realize that so called “gun free zones” are no less than a “killing zone” for some drugged up or mentally ill wacko who is looking to kill innocents and be assured that no one there will be carrying a weapon and be able to stop him? When are they going to realize that these same wackos intentionally look for gun free zones to carry out their evil plans? I suppose it’s possible that lawmakers may not even know that they have created a ‘killing zone’ out of a church, but South Carolina statutes clearly state that churches and places of religious study are on the list of places that one may not enter with a gun even if you have a permit for concealed carry or otherwise. They simply created the law to fit their agenda. The thing is that it is not necessary by law for a church to put up a sign with a silhouette of a gun in a red circle and a red line through it. It is not necessary for a church to display a sign stating that it is a “gun free zone” the way schools do. But they may as well put up a sign saying “KILLING ZONE” because that is what is was and is in Charleston, or for that matter, all schools and churches in South Carolina or anywhere else for that matter. 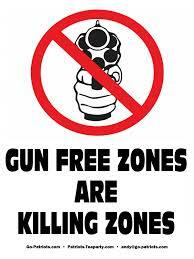 A “Gun Free Zone” and/or a sign stating such, will not protect anyone. Yes, it was indeed one Dylann Roof, a 21 year old disturbed young man who committed the heinous act, but it was the liberal law restricting guns from all churches, that gave him the perfect venue. Now I must admit that if there was no such law banning guns from church, it would not guarantee that there would have been any other members there carrying a gun. After all, one would think that church is a safe environment. But if only one other member there had a weapon, it would have turned out entirely different. I have heard in recent days, pastors come forward who have said that they welcome their parishioners who are properly licensed, to carry their weapon concealed to the church, that they have an agreement that they may do so in mutual recognition of the duty they have to provide protection for all in the event of an atrocity that might befall the congregation. I have also heard in the days following this most recent attack, that other pastors would do the same, if they could in their state that now bans such acts. I have also heard from pastors who are vehemently against the whole idea of guns in church. But at least they should have the choice, and not be handcuffed by liberal law makers who ban self-defense by law. That liberal lawmakers have created such conditions is in itself, a heinous act. Not only do liberals fail to recognize the unsafe conditions that they have created by banning guns from institutions, but they immediately set out to blame conservatives for the shootings when they happen. Within hours of the shooting, the bodies not yet cold, President Obama held a press conference wherein he blamed the shootings on the ease with which a person may obtain a gun. Hillary Clinton actually tried to blame Donald Trump for the environment which would allow this to happen. And a CNN interview set out to blame FOX News and Conservative Radio for coded messages they propagate in their hate filled commentaries that undoubtedly incite people to conduct such heinous acts. SERIOUSLY?? These leftist gun grabbing extremists must not be allowed to continue. They must be stopped, or at least exposed for racist, haters they are. It is they who spew these hate filled, racist ideas to churn up the low information hordes of reactionary mobs that would begin a riot or at the very least, continue with more of the same propaganda to further a liberal agenda. You never hear of right minded conservative proponents making such vile claims of the other side. Hell, they don’t even stand up for themselves, let alone make unsubstantiated claims as the left does. Our own Republican leaders in Congress are so spineless they willingly hand over much of what the left wants to pass. I grow weary waiting for the time that we might have a worthwhile group of leaders that actually stand up for conservative values as I remember we once had when I was growing up. We elect congressmen and senators who say they will stand up for our ideals who merely make a one-time feeble attempt at making change and then acquiesce to will and moderate desires of the Republican leadership. If our Republican ruling class will not to the job, we will have to vote ones in who will.